To create a precise laser engraving, you must use the right lens, appropriate working tables and a corresponding exhaust system. Last but not least, using the correct focusing plays a key role. 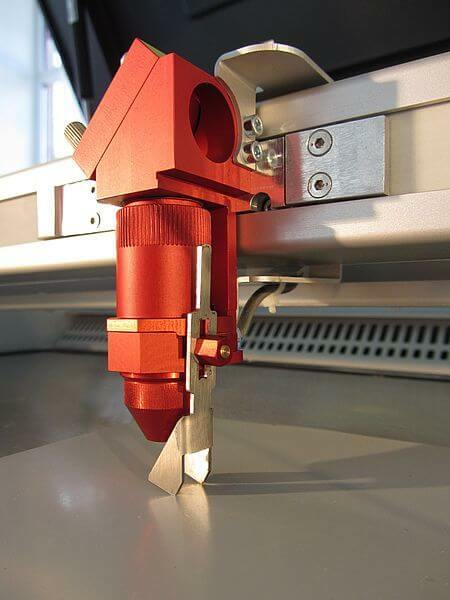 The correct setting of the focus - which means the right distance between the laser head and the material to be engraved - is crucial for a perfect application result. Trotec offers different modes for focusing. The Sonar TechnologyTM works with an ultrasonic sensor on the laser head. 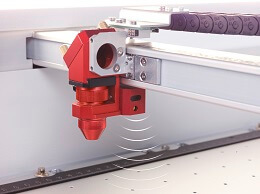 This sensor enables a very precise distance measurement on every position of the working table. With only one press of the button on the keyboard, the focus point is calculated automatically based on the lenses selected in the software. 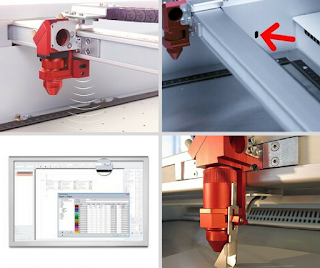 The working table will move in the appropriate focus position automatically. This focus mode is suited especially for all sound reflective materials. The Sonar TechnologyTM is a very efficient focus mode. Patent is pending. The Light Bar Focus works with sensors (light barriers) installed laterally in the enclosure. 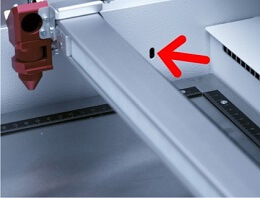 If the auto focus is enabled on the keyboard of the laser system, the processing table will move up. As soon as the material that you insert beforehand has passed the light barriers, the upward movement of the table will stop. Focusing is then complete and you can start the laser process. 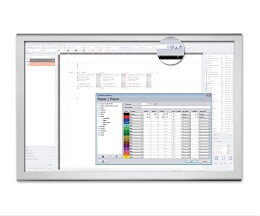 The Software Focus is an elegant method for approaching the exact height of the work table automatically. 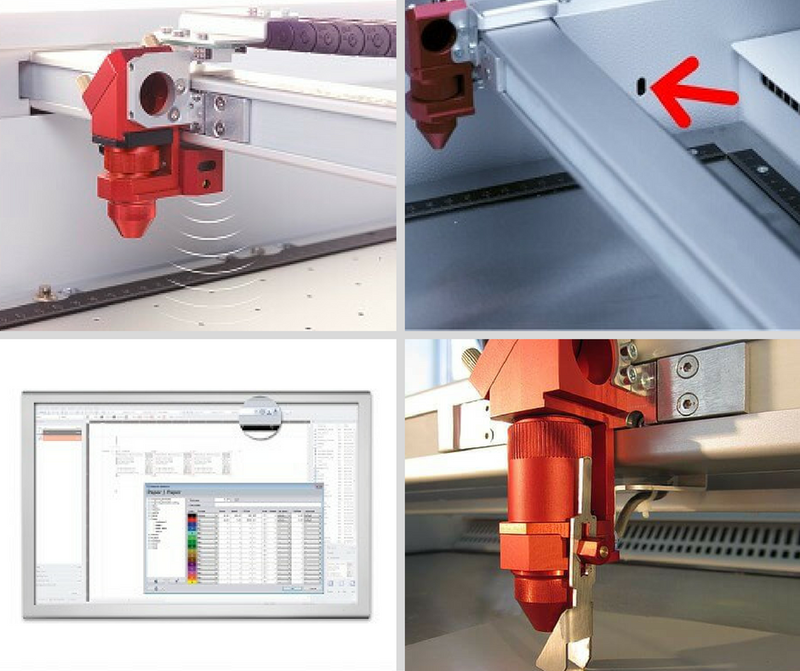 Thanks to the bi-directional connection, the computer always knows exactly at what height the work table is positioned. You then enter the material thickness and the lens used. The Trotec JobControlSoftware automatically calculates the optimal focus point. The table will then move to the correct position with only one press of the button. This focus mode is ideal for processing of materials of which the material thickness is known (ex. 6 mm Acrylic). The focus setting with the metal focus tool is fast and flexible. The operator simply hangs the focus tool on the laser head, and then moves the working table manually until the surface of the work-piece to be engraved touches the focus tool. Now the right focus point is set. The respective focus tool is pre-set to the focal length of the lenses and appropriately color coded. This method is especially useful when you work with a lot of different materials, if the material thickness is unknown or cannot be measured and for cylindrical objects.